As parents, we rightly worry about our children’s well-being. We want them to be healthy and happy. We hope they are internalizing habits that will help them be confident and successful throughout their lives. We assume that they will cultivate these habits at school—but very often, they won’t. The American Academy of Pediatrics recommends that children get at least 60 minutes of moderate to vigorous exercise a day. The benefits of movement are not just physical. Neuroscientific research demonstrates that movement improves cognition. And countless educational studies have shown the importance of play as children learn to navigate their social and emotional world. This research confirms what we know to be common sense. Then why is it uncommon for kids to have the opportunity to move at school? In January 2019, Maryland state legislators introduced the Student Health and Fitness Act, a bill requiring schools to provide “a program of physical activity totaling 150 minutes each week, including 90 minutes each week of physical education” for elementary-aged children. The bill mentions the “epidemic” of childhood obesity and notes how physical activity improves health, behavior outcomes, and academic achievement. As of today, the bill has yet to become law. 1. Recess is considered a privilege. 2. PE time is limited. In many cases, constraints within a school's budget and programmatic structure don’t allow for frequent or ample PE time. 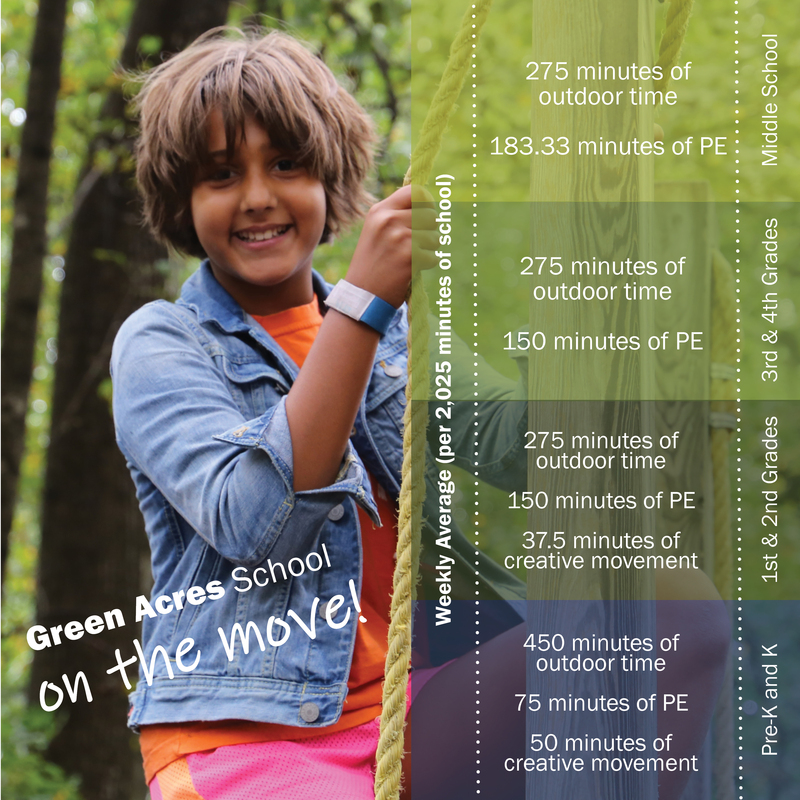 Lower School students at Green Acres have PE four times per six-day cycle, for 45 minutes each period. (By Middle School, PE class time increases to 55 minutes.) In addition to promoting fitness, wellness, and an overall healthy attitude towards exercise, PE at Green Acres also promotes respect for the uniqueness and differences of self and others through a wide variety of games and activities. Just like in the classroom, great emphasis is placed on collaboration and teamwork. 3. Children are expected to sit and stay at their desks. Movement doesn’t have to happen outdoors or in the gym. Classrooms should be set up in ways that foster collaboration, cooperation, and interaction among students. It’s hard to imagine them developing these core competencies while sitting in rows at individual desks, all facing the teacher (note that “compliance” is not considered a 21st-century skill). Look for classrooms that allow for multiple configurations, round-table discussions, and common spaces that can be used for larger projects. If student engagement is key to deep learning, we should be engaging the “whole” student—mind and body. Classes like creative movement, art, photography, drama, and robotics certainly don’t conform to the “desks-in-a-row” paradigm. Kinesthetic learning abounds at Green Acres! 4. Classes are rarely held outdoors. Going outside for class shouldn’t be an end-of-year treat. The natural world can and should be used to deepen and illuminate children’s understanding of any topic in math, science, art, literature—you name it. At Green Acres, small class sizes and 15 acres of pristine forest and waterways lend themselves to focused outdoor learning, cultivating students’ connection to nature and their sense of environmental stewardship. Likewise, almost every classroom opens to the outdoors; on temperate days, the learning spaces extend to adjacent picnic tables, our “Outdoor Classroom” in the woods, or even into our Gully. Richard Louv’s Last Child in the Woods: Saving Our Children from Nature Deficit Disorder (2005) laments how children’s relationship to nature has been lost to modern childhood. If you haven’t heard of this seminal book, read it! 5. Kids stay indoors at any sign of weather. Many schools hold indoor recess when it’s cold or raining (or muddy because it stopped raining). Imagine how this policy could result in kids staying inside all winter—or all spring! Green Acres students keep extra pairs of boots and cold-weather wear in their cubbies so that they’re prepared to go outside in all the elements (barring any dangerous weather). The trees on our wooded playground provide light shelter from rain and snow. We’d never pick a sedentary school day over getting students outside to explore our unparalleled outdoor spaces. Of course, we are proud to have a program designed on what's best for kids. Before all the research, before it was popular, before it was all over the news, Green Acres teachers have long understood how central movement and well-being are to children's ultimate success—and how school can and should nurture it.